The Kraken is a Cave Kraken slayer boss found within the Kraken Cove. The Kraken can only be fought while on a slayer task for Krakens or a boss task for the Kraken. 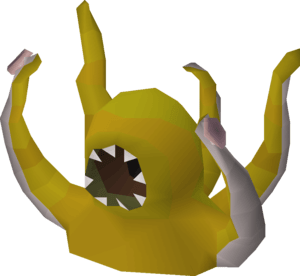 The Kraken is an extremely popular boss due to it’s relative ease and the fact that the Kraken drops Kraken tentacles and the Trident of the Seas, both are very highly in demand, especially by Ironmen. The most common tactic to use at the Kraken is to maximise magic damage and magic defence, there’s no need to use protection prayers as protect from magic is not effective, but you should use Augury or Mystic Might to maximise DPS. If you wish, you can pay 25k to gain access to an instance which will allow you to kill the Kraken without worrying about other players. The Kraken fight itself is very simple. In order to entice the Kraken out of the water, you must first attack each of the four small whirlpools. Attacking these whirlpools once with your ranged weapon will spawn an enormous tentacle. Do this four times to spawn all four tentacles and the switch back to your magic weapon and start dealing damage to the Kraken boss. Ensure you use Augury or Mystic Might to maximise magic defence and DPS. The Toxic Blowpipe is only used to disturb the four enormous tentacles in order to spawn the Kraken. You can swap this out for a Magic Shortbow and any arrow. The Rune Pouch can be used to increase your inventory space by storing the majority of rune drops from the Kraken. The Battlemage potion can be swapped out for a regular magic potion.